Ramatuelle Boy's Swim shorts St. Barth, boy's version of our Men's Ramatuelle swim shorts St. Barth. 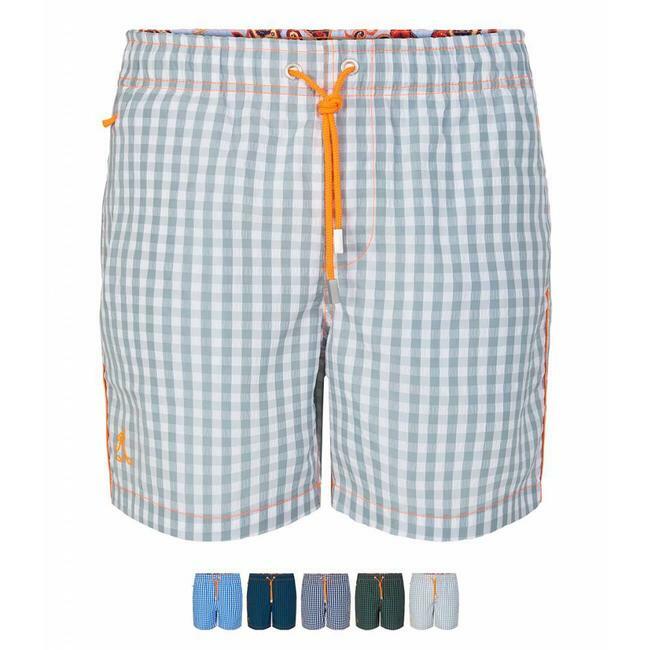 Read more..
Ramatuelle Swim shorts St. Barth is made of a seersucker fabric with small yarn dyed checkers. Seersucker is woven in such a way that some threads bunch together, giving the fabric a wrinkled appearance in places. This feature causes the fabric to be mostly held away from the skin when worn, facilitating heat dissipation and air circulation. The fabric is light weight, you will never feel sticky! Great comfort and superb looks go hand in hand! This shorts has all the Ramatuelle features: Elastic waistband with a fluor orange drawstring, fluor orange piping's in side seam and back. 2 side pockets and inside a small pocket with Ramatuelle showing on the map. Logo embroidery on the leg and contrast stitches in heavy yarn. Mesh inner brief with soft elastic around the leg openings. The swim shorts is packed in a self-fabric pouch. This swim shorts is available from size 1-2 years to 11-12 years. For corresponding men's or jeans sizes please check our size chart. Ramatuelle Swim shorts St. Barth is made of a seersucker fab..